Tuesday August 8 1911 Mr & Mrs Hoffman went out to keep house for me today. I did not get to sleep early last night and was with Mother all the rest of the night. We called the Dr at 6 oclock. I slept a couple of hours then and all afternoon. Wednesday August 9 1911 Mother not so well and in the afternoon she had a very bad spell We sent for the doctor and the boys but she got better. Will down for the evening. A terrible storm today. Thursday August 10 1911 Mother about back where she has been before today. I helped care for her and slept some Will here most of the afternoon. Mr [Bremer?] worse. 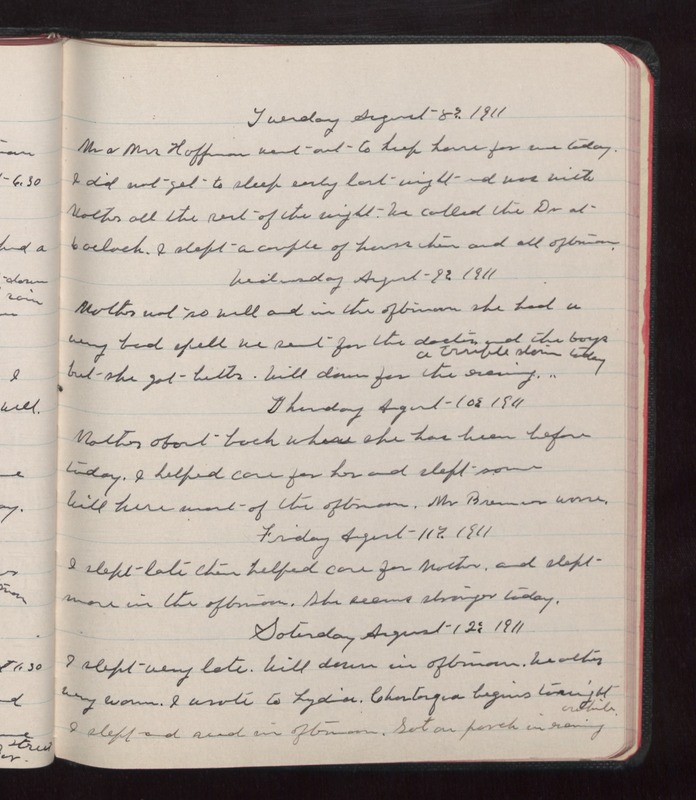 Friday August 11 1911 I slept late then helped care for Mother and slept more in the afternoon. Weather very warm. I wrote to Lydia. Chautauqua begins tonight I slept and read in afternoon. Sat on porch in evening [illegible].